It has been talked about for years, and now known as ‘U-Med Northern Access’. If completed, the project will join the northern part of Bragaw St. [north of Northern Lights Blvd.] to the southern portion [now known as Elmore Rd.] that now runs from 36th Ave. all the way south to God knows where [to Rabbit Creek Rd., but there’s a break or two in the southern leg before there — as an arterial, it goes no further than Abbott Rd.]. Anyway, the northern end terminates at the outer edge of the Mt. View neighborhood. When all the sections are joined, this will one of the longest roads in the Anchorage bowl. And that is all that this story has to do with Mt. View directly. This is more of a lament about loss of ecological diversity — fundamentally a quality of life concern. 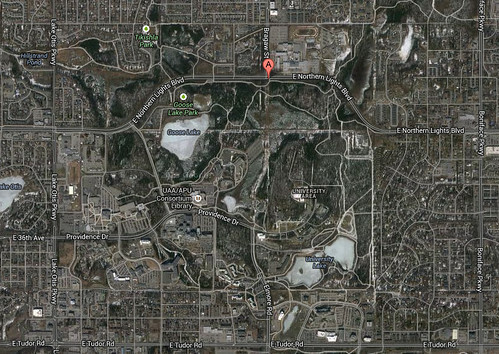 Google Maps recent aerial showing UAA, APU and Providence Hospital land holdings. When I was first in Anchorage in 1971, the area the campus was in felt like the edge of civilization — as if you could walk away from the parking lot at AMU and right into a wild area leading directly to a path to a mountain valley above the tree line, without ever seeing any sign of human habitation. Most but not all of this feeling is now gone, but we seem determined to eradicate it entirely. I attended a Public Open House about the road project on Feb. 18th. There were at least a couple hundred people there, and it seemed to me that about half were against the project, and the other half were undecided but interested in listening and finding out more. There was a presentation by the road design engineer, Dowl HKM President Stuart Osgood, followed by a Q&A session where around 20 questions from the public were fielded. Only one questioner seemed very positive about the road. This is where you should read between the lines a bit. By placing the word PARK in quotation marks, Dowl manages to heap on a bit of scorn and scolding, while sort of correcting the record — no, dear reader, this parcel is NOT a park, nor has it ever been. It is develop-able land, owned by UAA and they can do what they like with it — and the fact that it is a large, intact chunk of boreal forest, wetland and wildlife habitat is immaterial. If you need further reasons to be skeptical, note that travel times will not be decreased very much, according to their own 2011 study [see page numbers 50-52; pages 58-60 of the PDF]. What their data says when parsed is that travel times will be reduced less than five minutes at most [rush hours] after the new road segment is in place. Osgood went on to note, “If you throw out all the comments in this first category, all of the ones that are left are constructive…” and without any suggestion the project is ill-conceived or should not advance. Subtext: you dirty hippies are the only ones holding up progress, for no good reason. This line of thinking is particularly egregious, reckless and irresponsible. When Osgood says, it doesn’t matter that we are going to destroy this land’s current function as an ecosystem and little corner of urban wilderness, what he really means is it doesn’t matter to HIM. And if HE wants to experience pristine, unspoiled Alaska all he has to do is gather some friends and family and ride their snowmachines out to their cabin, or drive down to Whittier and go out on their boat for a long weekend. The public, half of whom do not have a pot to piss in have a much different perspective. They might not even ever make it to Glen Alps or Bird Ridge, let alone Surprise Cove or China Poot Bay or a Bristol Bay fishing lodge or anyplace else you need money to get to — but they may very well walk around the trails at University Lake, Russian Jack, Kincaid Park and so forth. Reasonable people may disagree about whether or not Anchorage has a traffic problem. Sure, there are times when it gets frustrating making your way across town in a vehicle — but it’s never as bad as what you will find in Seattle, LA, Chicago, etc. Why do we have traffic jams at all, when we have a relatively less densely populated city [in terms of average number of inhabitants per square mile]? The answer [and it’s also the reason why building new roads and widening ones we already have is never going to reduce congestion] is we have created Anchorage [outside of downtown] using a bad development pattern. Why have suburban areas, with their height limits and low density of population, proved to be such a traffic nightmare? The first reason, and the obvious one, is that everyone is forced to drive. In modern suburbia, where pedestrians, bicycles, and public transportation are rarely an option, the average household currently generates thirteen car trips per day. Even if each trip is fairly short — and few are — that’s a lot of time spent on the road, contributing to congestion, especially when compared to life in traditional neighborhoods. But even if the suburbs were to generate no more trips than the city, they would still suffer from traffic to a much greater extent because of the way they are organized. The diagram shown here illustrates how a suburban road system, what engineers call a sparse heierarchy, differs from a traditional street network. The components of the suburban model are easy to spot in the top half of the diagram: the shopping mall in its sea of parking, the fast-food joints, the apartment complex, the looping cul-de-sacs of the housing subdivision. Buffered from the others, each of these components has its own individual connection to the larger external road called the collector. Every single trip from one component to another, no matter how short, must enter the collector. Thus, the traffic of an entire community may rely on a single road, which, as a result, is generally congested during much of the day. Sounds familiar, eh? Anchorage as it now exists consists of about 20 of the above-described cluster fucks. The stated purpose of the Feb. 18th Open House was to select a route [from four alternatives]. Then the design will be further developed by the engineering team. The “orange route”, the most direct of the four was declared the winner, and a slightly more detailed schematic was presented [above]. The concept includes: one traffic lane in each direction; three roundabouts; a bike lane each side of the roadway; a wide sidewalk one side and three pedestrian overpasses similar to the one across Raspberry Rd. on the way into Kincaid Park. Osgood said, “You’d think it would be easy to build a 7/10th of a mile long road section for $20 million, but the budget is actually really tight.” Indeed, the $20 million allocated seems low, considering there are still substantial issues associated with wetlands designation/design/permitting that Dowl has to deal with before construction begins; there will be a greater than typical extent of drainage infrastructure along the route; and it’s unclear to what extent the road will integrate into the surroundings. Will the existing network of trails be reworked to tie into the new pedestrian bridges, or will trail segments be abandoned/orphaned in the process? What will happen if $30 or $40 million is really needed to build the road as conceived? Will the State Legislature appropriate more funds? 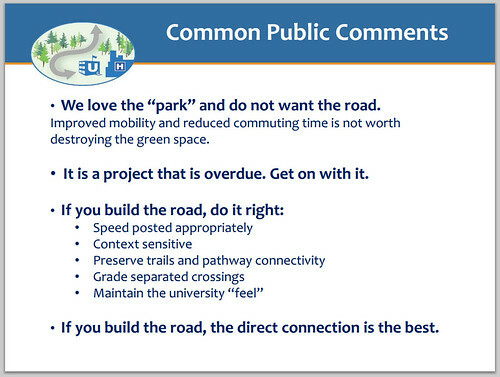 Or [more likely, if I had to guess] will some of the non-vehicular amenities be cut? Some have said, it’s well known that $20 million is inadequate but the project proponents just want to get started on it, and with the current composition of the Anchorage Assembly, the Mayor, the State Legislature [conservatives and conservative majorities] it seems like a good time to pull the trigger on it. Local activist Walt Parker, a former head of the State Dept. of Transportation and a quiet voice of reason in this and similar debates said at a recent meeting, “In the old days when a project like this would be proposed we would start by asking simple questions. ‘Is it good for Anchorage?’ and ‘Would we be disadvantaged if we did not pursue it? '” It seems that whatever process we now have in place to arbitrate long term transportation and land use planning [at a local, regional and state level] manages to skip these basic initial questions. The lesser informed members of the public tend to be confused by the processes we employ. When the State hires Dowl HKM to facilitate a public process, they are doing so as a player with a stake in the outcome. If the public, lawmakers and other stakeholders approve, Dowl is hired to design the road and administer its construction. They have made millions off similar projects. They say we should trust their judgment. And to their credit, Dowl is [in one sense] NOT selling snake oil here. Their other road projects, including the southern portion of Elmore Rd., East 15th Ave. and several others are high quality. They really are capable, as they tell us of doing a lot better job with roads than in the old days [missteps we are still living with every day] — including the integration of transit and trails, pedestrian and bike ways and better safety and sense of place. What they do not excel at is determining whether it is wise to build and/or expand roads in the first place. The public needs and deserves an impartial process, not subject to partisan political maneuvering, and run by expert planners who do not have an agenda or ax to grind. My position might have shifted somewhat, had the two universities and Providence Hospital been more strident and pleading with the public that the road is badly needed, and they can’t live without it. I don’t see this. Their position is ambivalent at best — yes, access is good, better access is always welcome. Does UAA have a Master Plan for its campus expansion? How does the road tie into it? Isn’t there a scenario where UAA/APU/Prov would benefit by NOT expanding into the undeveloped area [especially with more two- and three-story buildings separated by large surface parking lots]? The 2011 report identifies the northern part of the site as a “Community Engagement Zone”, but they don’t really say what this is exactly — what they would like to build there and why it needs to be in that location. 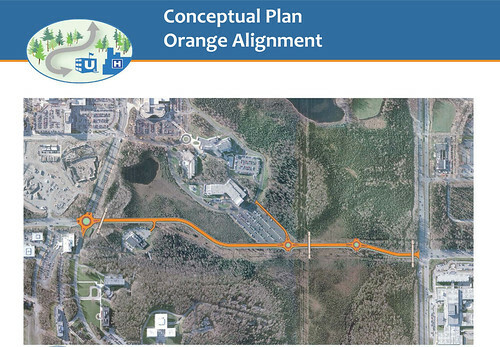 Osgood noted during the presentation that the northernmost of the three new roundabouts will eventually link up with a east-west internal access road that will serve future university facilities. But UAA might have better options, to redevelop and re-purpose existing sites that already have utilities and road access. One of the questions from the public on Feb. 18th was something like, aren’t there more pressing needs we should be spending $20 million on? Osgood said, he can’t answer that [it’s out of his area of expertise], and he assumed the question was rhetorical anyway [it wasn’t]. The Democratic coalition of the State Legislature is holding a hearing on a bill to pull the $20 million allocation for the project next week. Their bill has no chance of passing unless some Republicans get on board. But it is a good opportunity to provide feedback, and I encourage anybody with concerns on the matter to contact your legislators.